None of us like taxes, but for one of the largest U.S. companies to use schemes and tactics to protect its income from the IRS is unpatriotic, and in the case of Apple, it led to a significant shortfall in government revenues. Even the most conservative estimates of what Apple sheltered would have brought billions to federal coffers – money that could’ve saved many health and safety programs from Sequester’s chopping block. 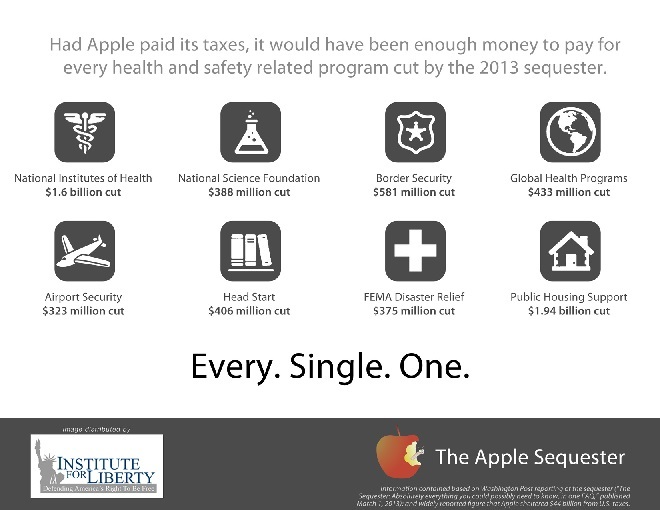 Programs like early childhood education through Head Start, public housing support, and health research at NIH all are victims of The Apple Sequester. Apple is saying that they didn’t skirt the law – and that what they did was within the letter of the law. Even if that’s true, their actions are profoundly un-American and especially insulting since millions of Americans support their company.